This month's challenge is a Theme Challenge! create a project that is all about Love! You have TWO WEEKS to play along - Deadline to enter is Friday, February 5th, 2015 at Midnight CST. The winners will be announced on the NND blog on Monday, February 8th. Post your project to your blog or to an online photo gallery such as Flickr, Pinterest, or splitcoaststampers (on splitcoast please use keywords newtonsnook and IPC28). Here is an adorable Valentine by Jess! She used the cute frog image and "Hoppy Valentine's Day" sentiment from our Hoppy Days Stamp set! I love how the colors pop off the black background! 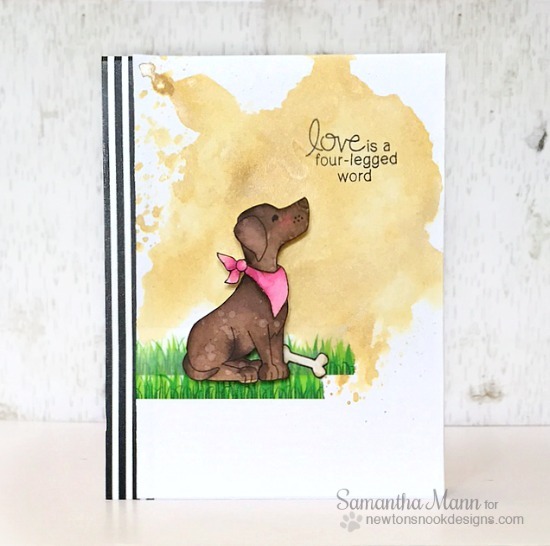 Samantha used the cute pup from our Fetching Friendship stamp set for her love-themed creation! Pet lovers will definitely agree that LOVE is a four-legged word! Here is delightful Valentine by Yukari! That sweet kitty image, eiffel tower and hot air balloons are from the Newton Dreams of Paris stamp set. I love the scene she created with them! Then she added the "Happy Valentine's Day" sentiment using our Simply Seasonal stamp set! 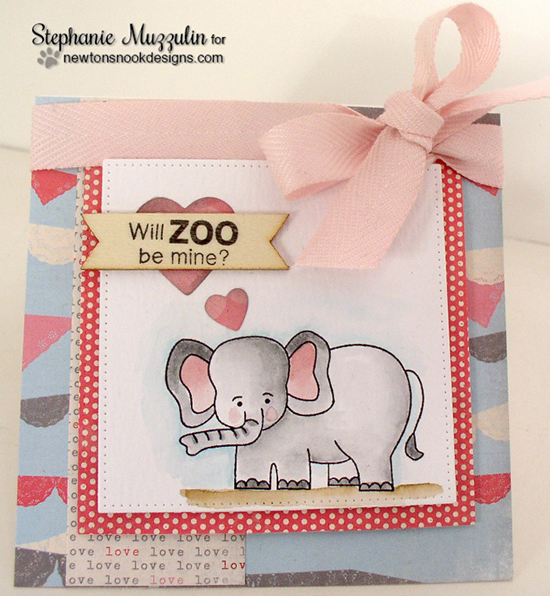 Here is an adorable Love card by Stephanie featuring our elephant image from the Wild about Zoo stamp set. I love the big pink bow and the "Will ZOO be mine?" sentiment on the wood! 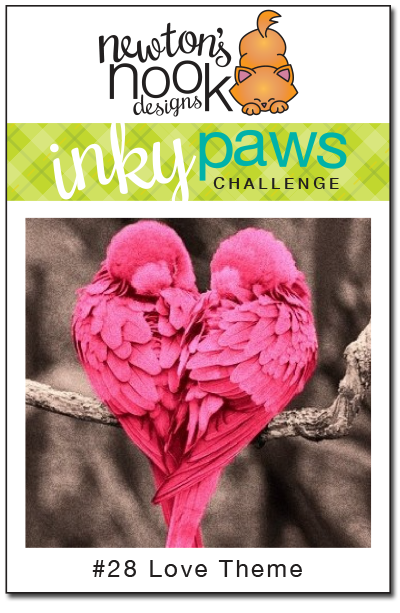 This sweet card by Danielle is purr-fect for Valentines Day! This image from the new Darling Duos stamp set is perfect to go with the "I just want to Snuggle" sentiment that Danielle created! 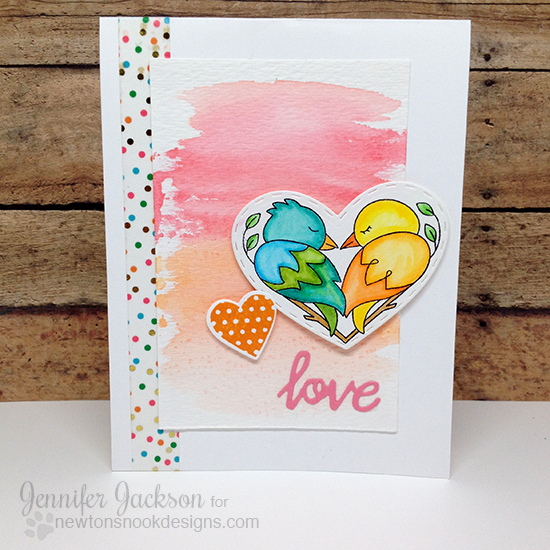 The rainbow hearts on this card by Kimberly look good enough to eat! She used our new Darling Hearts die to cut out the hearts and the "thinking of you" sentiment is from our Whispering Pines stamp set! And lastly, here is what I created. I used the love birds from our new Darling Duos stamp set and colored them bright colored copics. I cut them out with the coordinating Darling Hearts die set. I also added the small heart & "love" sentiment from the die set.